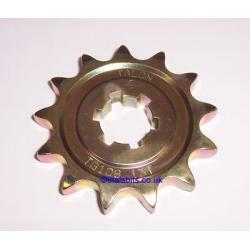 A Talon Gearbox sprocket for the Yamaha TY125 and TY175 models. This is the original 428 chain size, and is available with 11, 12 or 13 teeth. Please choose your preferred one from the dropdown. Heavy Duty 520 sprockets for the TY125 and TY175 are also available on this site.